117. Have you ever considered suicide? What is so important to you that without it life would not be worth living? Sorry for the depressing question this week. 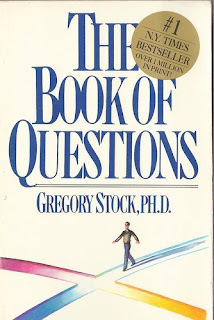 I've gone through The Book of Questions and made a note of all the questions that appeal to me and this is the only question that really jumped out at me when I sat down to write this post. I'm not sure that anyone would consider my answer surprising, especially if you've read my blog for any length of time. The answer is yes, I have considered suicide. But that overwhelming feeling that life is not worth living is something that I've mostly left behind, thankfully. As a teenager I was very unhappy. Things at home were very emotional and unstable. I didn't feel like I fit in anywhere and I didn't feel as though I had a support group that I could turn to when things got bad. I was making more and more choices towards very self-destructive behaviours and my most constant feelings at this time were of self-hatred. And the thing that is so important that without it life would not be worth living? Hope. I didn't feel as though there was any hope that my life, my relationships, my feelings towards myself would ever get better. I didn't see a future for myself, I was blinded by the circumstances that I was in and I couldn't see that things would ever get better. At least not until I did. I can see now, looking back at my teenage years that things happened very gradually. I realised that I wasn't able to connect on an emotional level to the people in my life at the time, so I made other choices. A good therapist probably would have been the ideal option, but it wasn't an option that I had going for me. So I turned to the Internet in order to release some of the demons I held inside of me. Talking through things, knowing that I'm not alone, that I'm not the only person suffering really helped me. Meeting people, albeit virtually, who seemed to care about me and about my wellbeing helped to bolster some of my self-esteem. At the same time, I found my reading choices had been branching out into other things and this wider perspective of the world that I was gaining through different pieces of literature also helped me to see a bigger picture. There were many reasons that I never took that step. And I'm really glad that I was never so hopeless enough to give up because things really did get better in numerous ways.